Disney Frozen Anna Doll And Toddler Dress Combo Only $21! You are here: Home / Great Deals / Christmas Deals / Disney Frozen Anna Doll And Toddler Dress Combo Only $21! Wow – here’s a FANTASTIC deal for all of you whose little girls love Frozen! Grab the Disney Frozen Anna Doll and Toddler Dress Combo for just $21 (reg. $34)! These items retail for more than this individually, so this is a GREAT deal! My daughter’s been wanting both of these, so I’m grabbing this for Christmas! 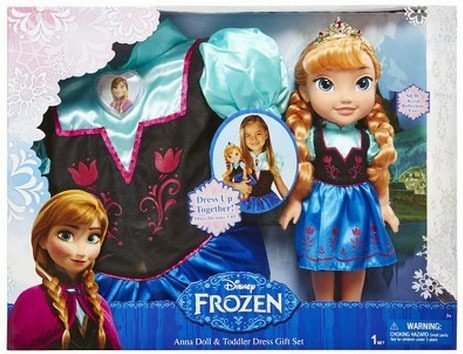 She’ll squeal with delight when she sees the Disney Frozen Anna Doll and Toddler Dress Combo. This fantastic combination not only gives your little one an Anna doll to play with, but she can look just like her with her very own Anna dress. Hours of magical fun will follow with this enchanted Disney Frozen package.